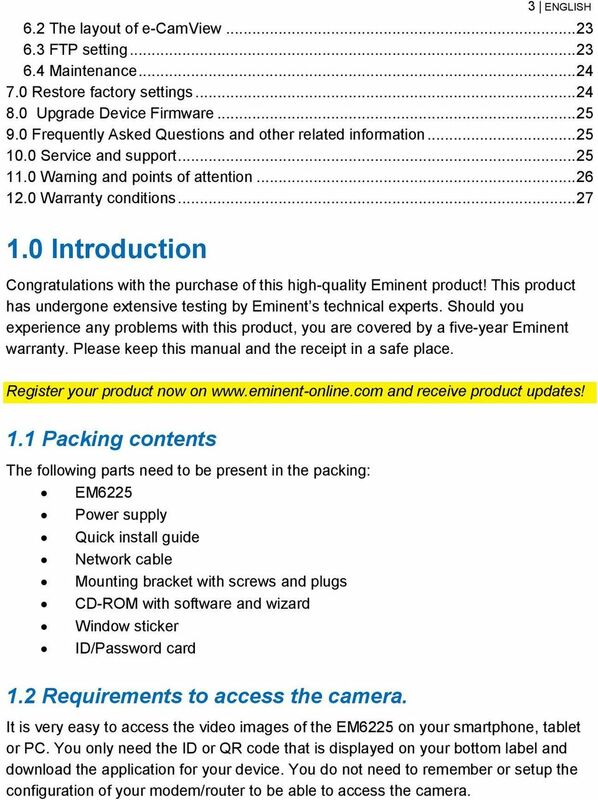 Download "EM6225 e-camview Pan/Tilt HD IP camera"
3 3 ENGLISH 6.2 The layout of e-camview FTP setting Maintenance Restore factory settings Upgrade Device Firmware Frequently Asked Questions and other related information Service and support Warning and points of attention Warranty conditions Introduction Congratulations with the purchase of this high-quality Eminent product! This product has undergone extensive testing by Eminent s technical experts. Should you experience any problems with this product, you are covered by a five-year Eminent warranty. Please keep this manual and the receipt in a safe place. Register your product now on and receive product updates! 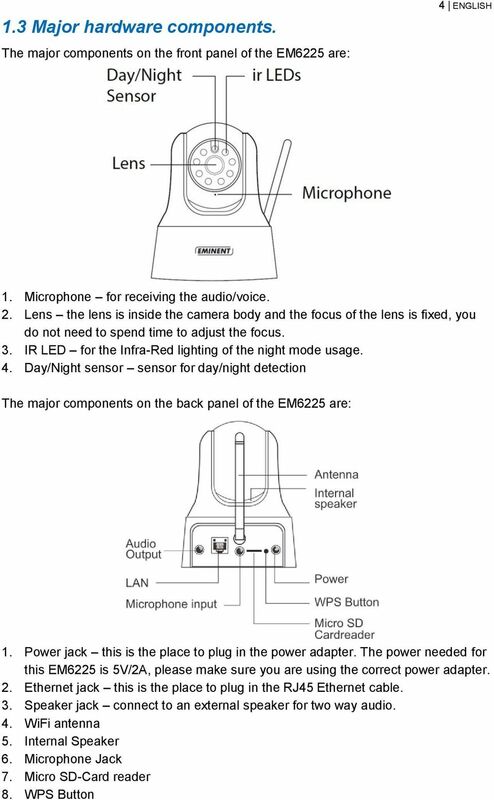 1.1 Packing contents The following parts need to be present in the packing: EM6225 Power supply Quick install guide Network cable Mounting bracket with screws and plugs CD-ROM with software and wizard Window sticker ID/Password card 1.2 Requirements to access the camera. 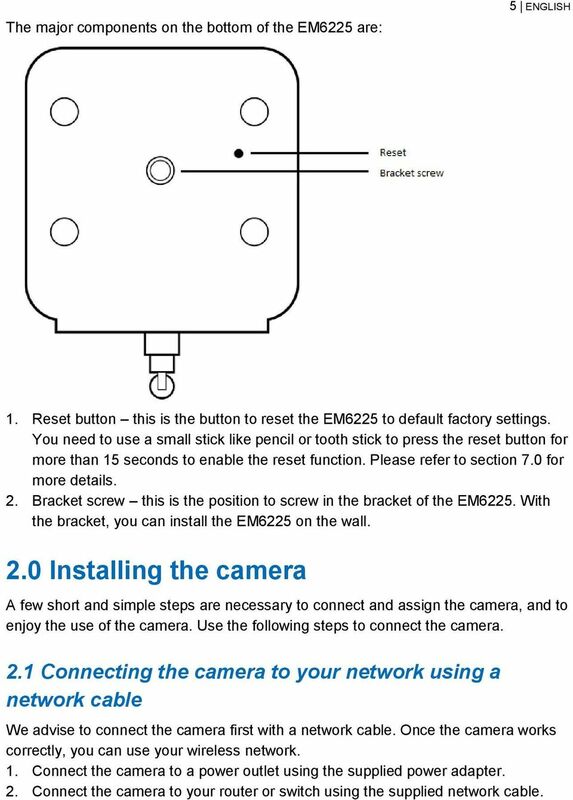 It is very easy to access the video images of the EM6225 on your smartphone, tablet or PC. You only need the ID or QR code that is displayed on your bottom label and download the application for your device. 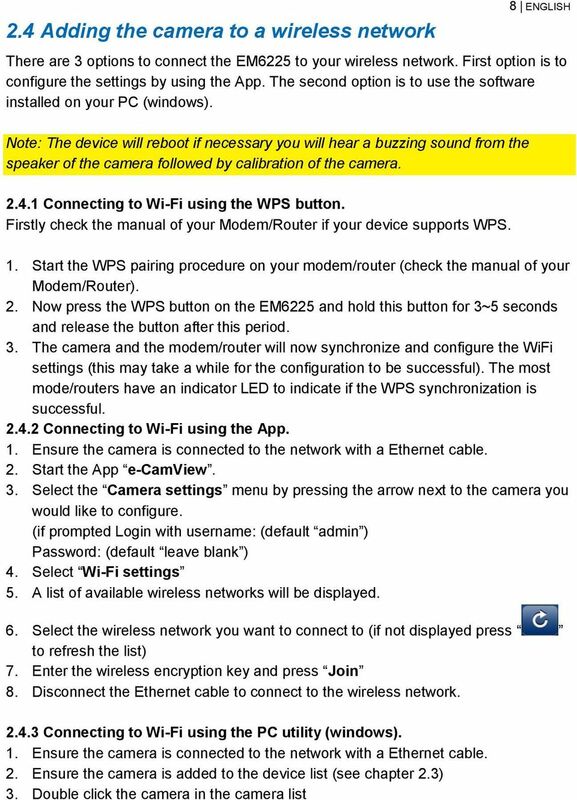 You do not need to remember or setup the configuration of your modem/router to be able to access the camera. 5 The major components on the bottom of the EM6225 are: 5 ENGLISH 1. Reset button this is the button to reset the EM6225 to default factory settings. You need to use a small stick like pencil or tooth stick to press the reset button for more than 15 seconds to enable the reset function. Please refer to section 7.0 for more details. 2. Bracket screw this is the position to screw in the bracket of the EM6225. With the bracket, you can install the EM6225 on the wall. 2.0 Installing the camera A few short and simple steps are necessary to connect and assign the camera, and to enjoy the use of the camera. 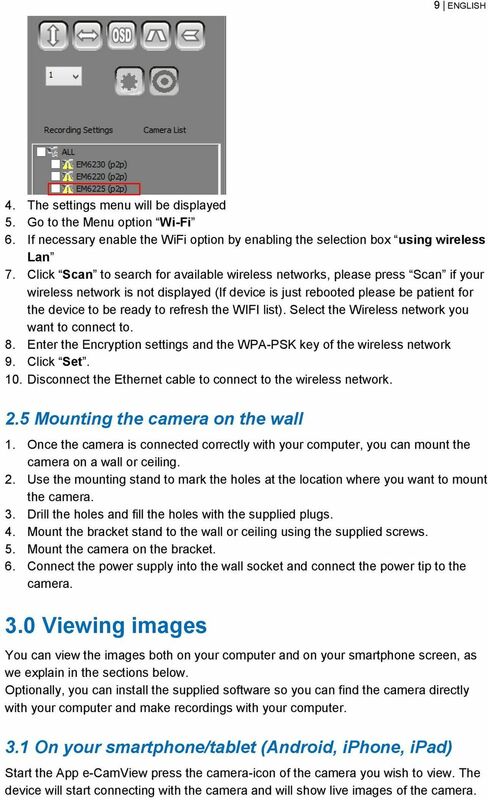 Use the following steps to connect the camera. 2.1 Connecting the camera to your network using a network cable We advise to connect the camera first with a network cable. Once the camera works correctly, you can use your wireless network. 1. Connect the camera to a power outlet using the supplied power adapter. 2. Connect the camera to your router or switch using the supplied network cable. 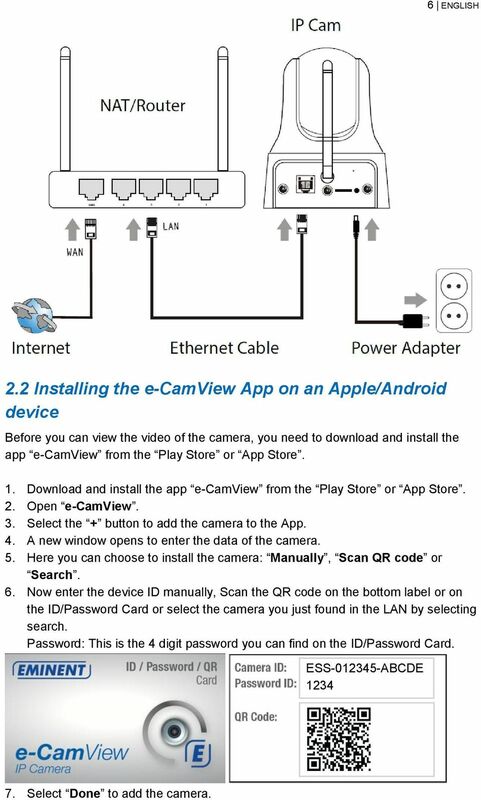 6 6 ENGLISH 2.2 Installing the e-camview App on an Apple/Android device Before you can view the video of the camera, you need to download and install the app e-camview from the Play Store or App Store. 1. Download and install the app e-camview from the Play Store or App Store. 2. 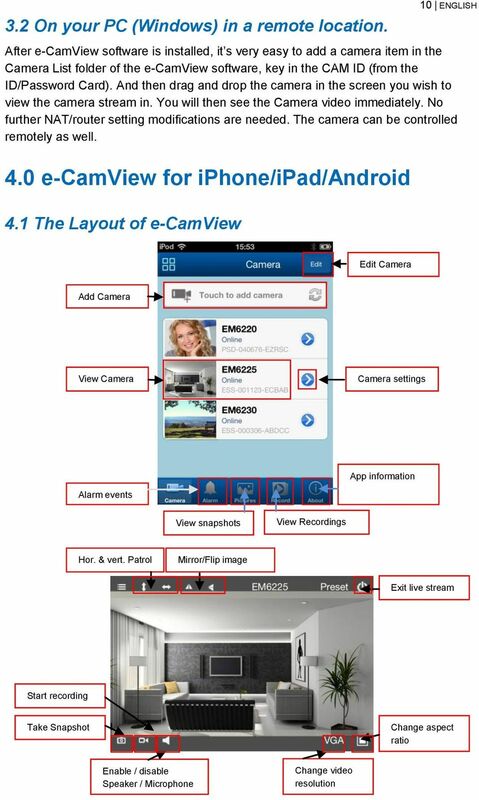 Open e-camview. 3. Select the + button to add the camera to the App. 4. A new window opens to enter the data of the camera. 5. Here you can choose to install the camera: Manually, Scan QR code or Search. 6. 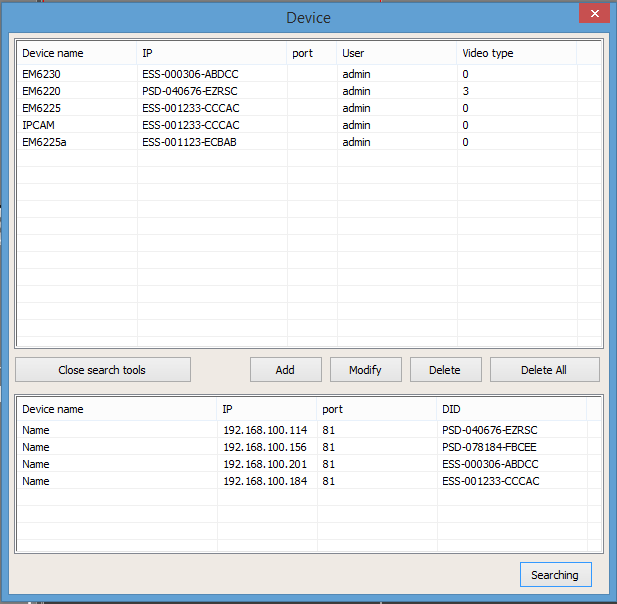 Now enter the device ID manually, Scan the QR code on the bottom label or on the ID/Password Card or select the camera you just found in the LAN by selecting search. Password: This is the 4 digit password you can find on the ID/Password Card. ESS ABCDE Select Done to add the camera. 9 9 ENGLISH 4. The settings menu will be displayed 5. Go to the Menu option Wi-Fi 6. 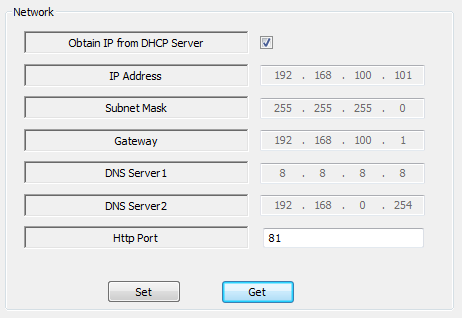 If necessary enable the WiFi option by enabling the selection box using wireless Lan 7. Click Scan to search for available wireless networks, please press Scan if your wireless network is not displayed (If device is just rebooted please be patient for the device to be ready to refresh the WIFI list). Select the Wireless network you want to connect to. 8. 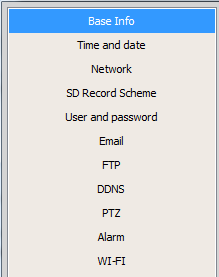 Enter the Encryption settings and the WPA-PSK key of the wireless network 9. Click Set. 10. Disconnect the Ethernet cable to connect to the wireless network. 2.5 Mounting the camera on the wall 1. Once the camera is connected correctly with your computer, you can mount the camera on a wall or ceiling. 2. Use the mounting stand to mark the holes at the location where you want to mount the camera. 3. Drill the holes and fill the holes with the supplied plugs. 4. Mount the bracket stand to the wall or ceiling using the supplied screws. 5. Mount the camera on the bracket. 6. Connect the power supply into the wall socket and connect the power tip to the camera. 3.0 Viewing images You can view the images both on your computer and on your smartphone screen, as we explain in the sections below. 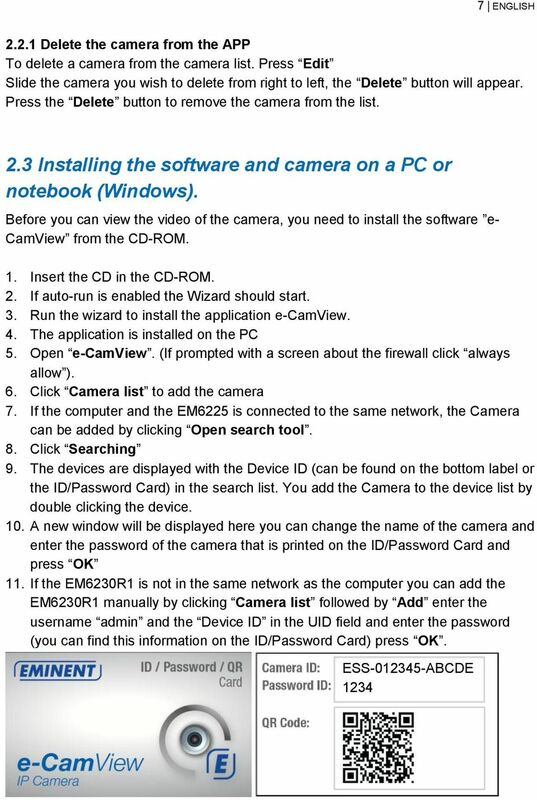 Optionally, you can install the supplied software so you can find the camera directly with your computer and make recordings with your computer. 3.1 On your smartphone/tablet (Android, iphone, ipad) Start the App e-camview press the camera-icon of the camera you wish to view. The device will start connecting with the camera and will show live images of the camera. 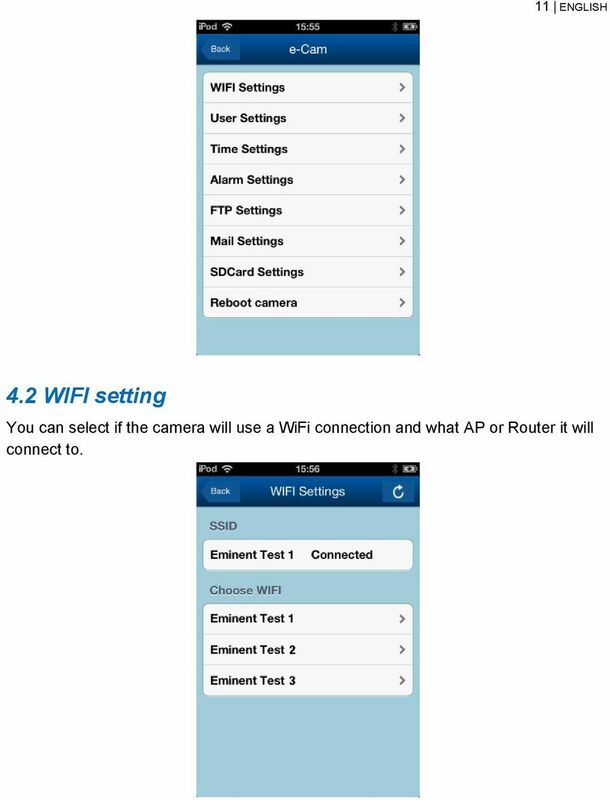 11 11 ENGLISH 4.2 WIFI setting You can select if the camera will use a WiFi connection and what AP or Router it will connect to. 12 4.3 User setting Here you can change the user settings of the Camera. 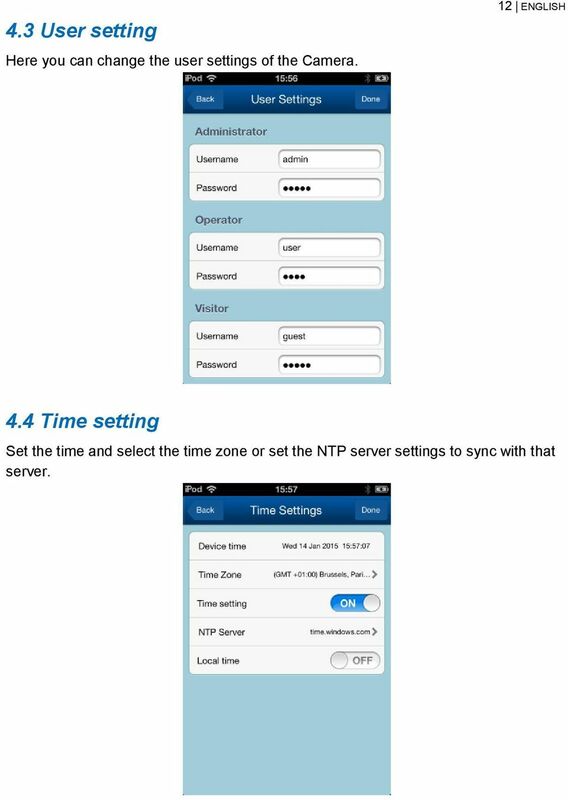 12 ENGLISH 4.4 Time setting Set the time and select the time zone or set the NTP server settings to sync with that server. 14 4.7 Mail setting Here you can set your mail settings to enable the alarm notifications to the addresses you have set. 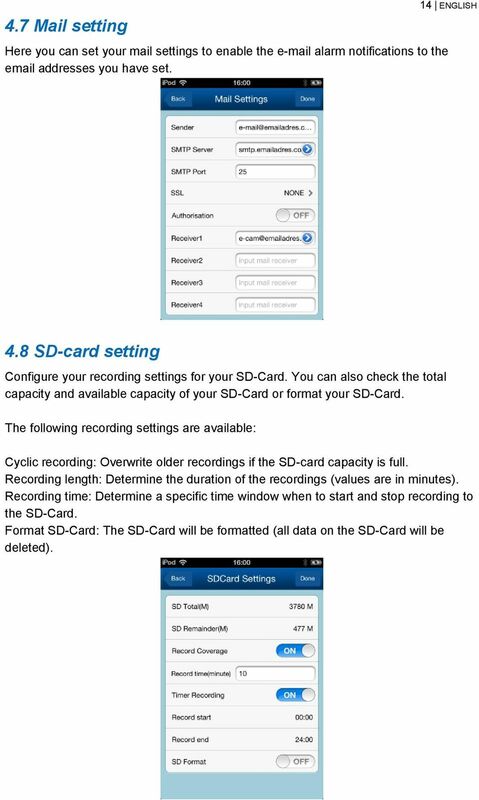 14 ENGLISH 4.8 SD-card setting Configure your recording settings for your SD-Card. You can also check the total capacity and available capacity of your SD-Card or format your SD-Card. The following recording settings are available: Cyclic recording: Overwrite older recordings if the SD-card capacity is full. Recording length: Determine the duration of the recordings (values are in minutes). 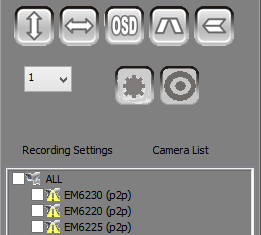 Recording time: Determine a specific time window when to start and stop recording to the SD-Card. Format SD-Card: The SD-Card will be formatted (all data on the SD-Card will be deleted). 16 5.2 Recording settings By default the camera saves the snapshot and recordings to the following path D:\Picture, D:\Record. 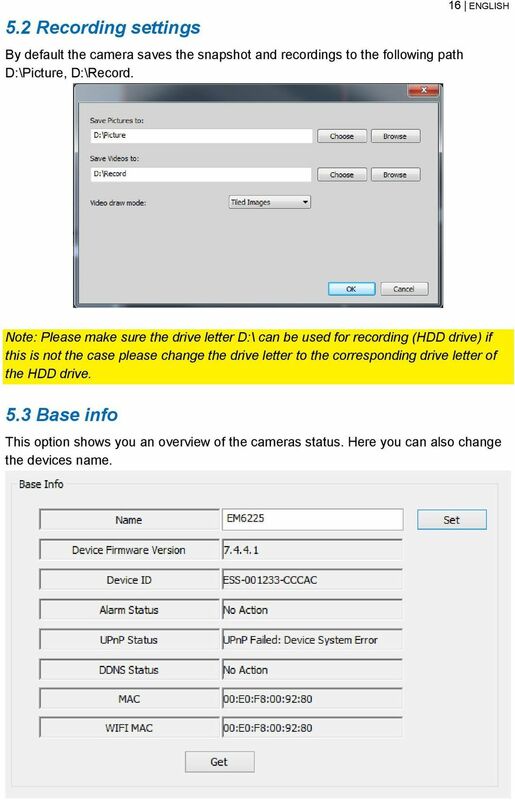 16 ENGLISH Note: Please make sure the drive letter D:\ can be used for recording (HDD drive) if this is not the case please change the drive letter to the corresponding drive letter of the HDD drive. 5.3 Base info This option shows you an overview of the cameras status. Here you can also change the devices name. 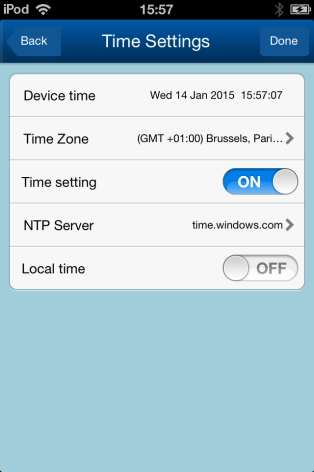 17 5.4 Time setting 17 ENGLISH Set the time and select the time zone or set the NTP server settings to sync with that server. 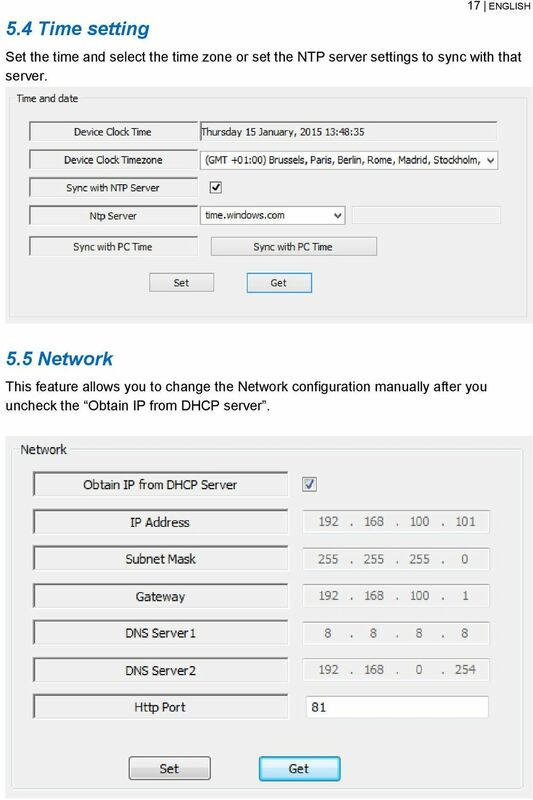 5.5 Network This feature allows you to change the Network configuration manually after you uncheck the Obtain IP from DHCP server. 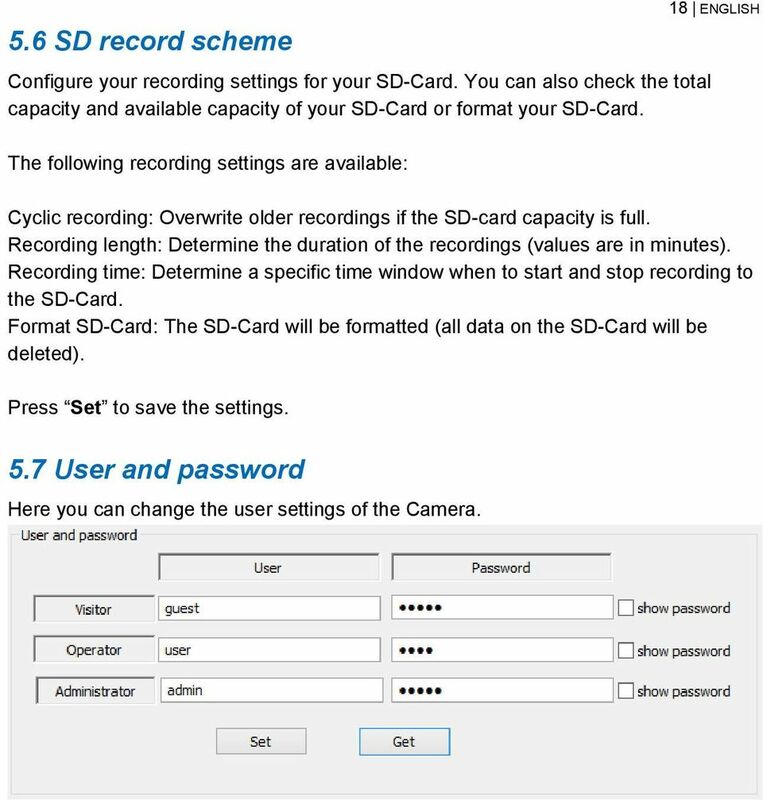 18 5.6 SD record scheme Configure your recording settings for your SD-Card. You can also check the total capacity and available capacity of your SD-Card or format your SD-Card. 18 ENGLISH The following recording settings are available: Cyclic recording: Overwrite older recordings if the SD-card capacity is full. Recording length: Determine the duration of the recordings (values are in minutes). 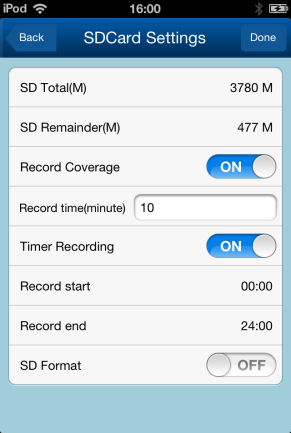 Recording time: Determine a specific time window when to start and stop recording to the SD-Card. Format SD-Card: The SD-Card will be formatted (all data on the SD-Card will be deleted). Press Set to save the settings. 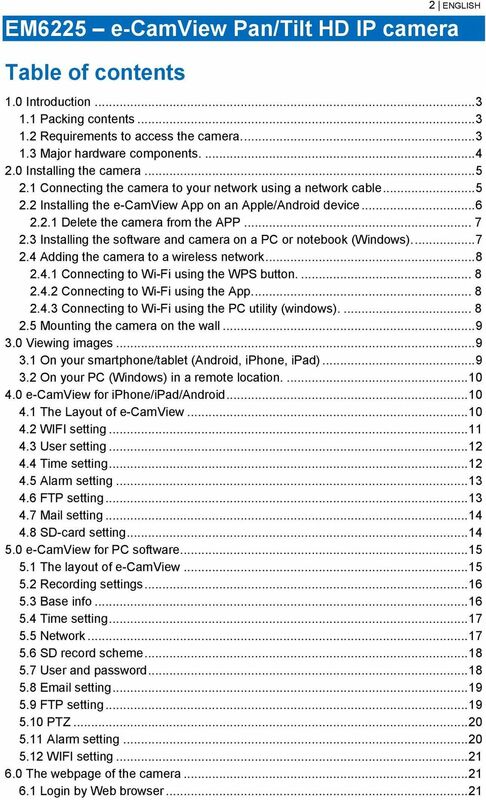 5.7 User and password Here you can change the user settings of the Camera. 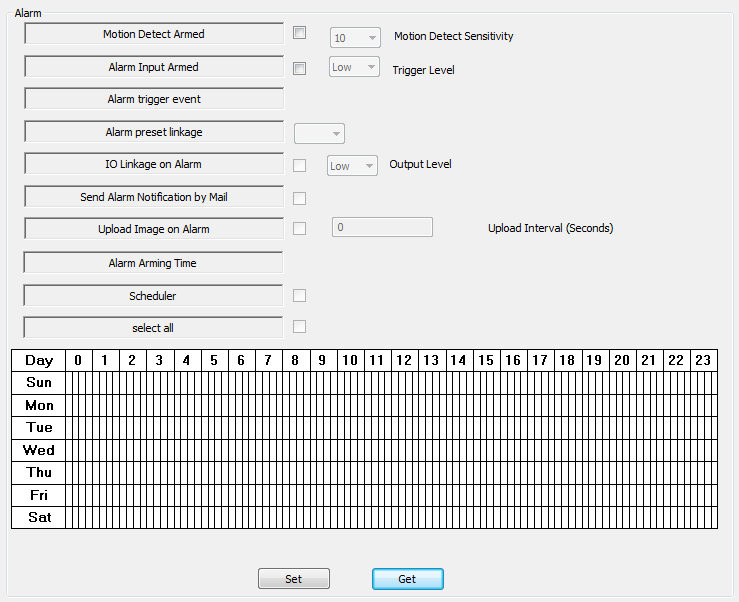 20 5.10 PTZ 20 ENGLISH Here you can set the Pan/Tilt: boot preset, Speed and the amount of cruise cycles 5.11 Alarm setting Here you can enable the Alarm, set the alarm triggers and events. 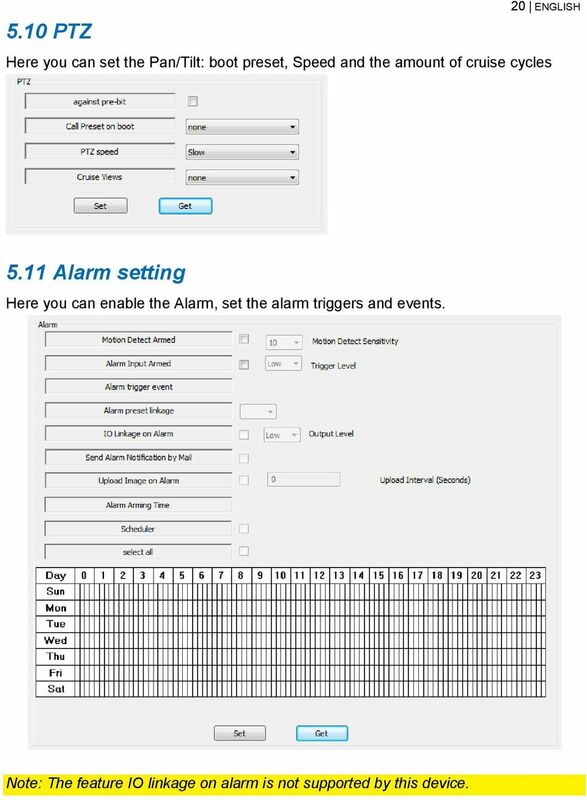 Note: The feature IO linkage on alarm is not supported by this device. 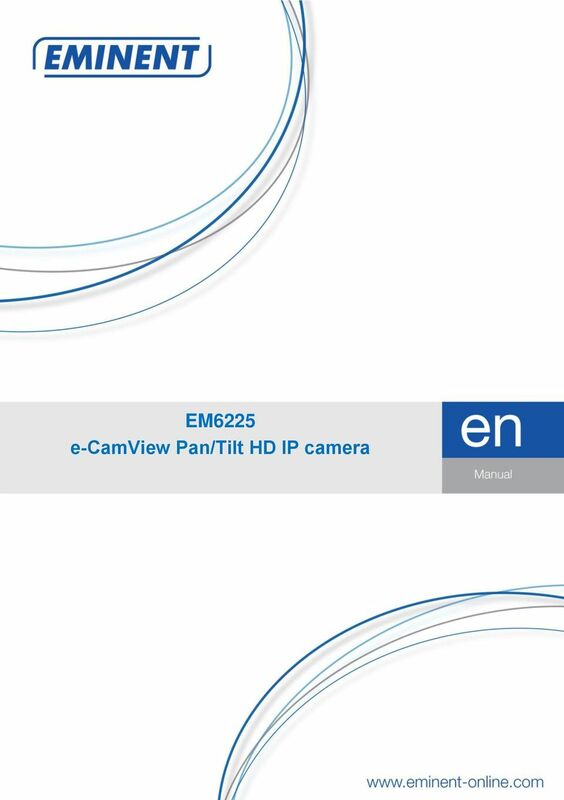 23 6.2 The layout of e-camview 23 ENGLISH Change video resolution Pan/Tilt control Hor. & vert. 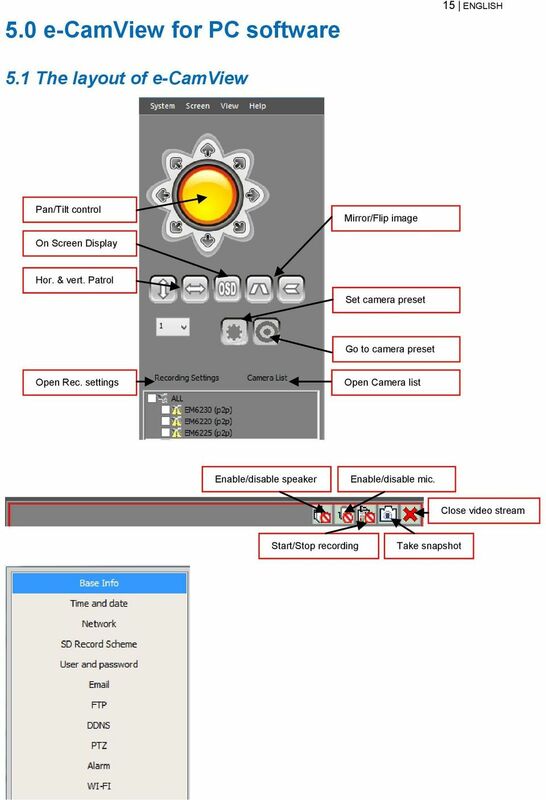 Patrol Zoom Take Snapshot Start recording Enable / disable Speaker Enable / disable Microphone Recording path Settings menu The menu options are the same as the settings menu of the PC software with the exception of FTP service settings and Maintenance. 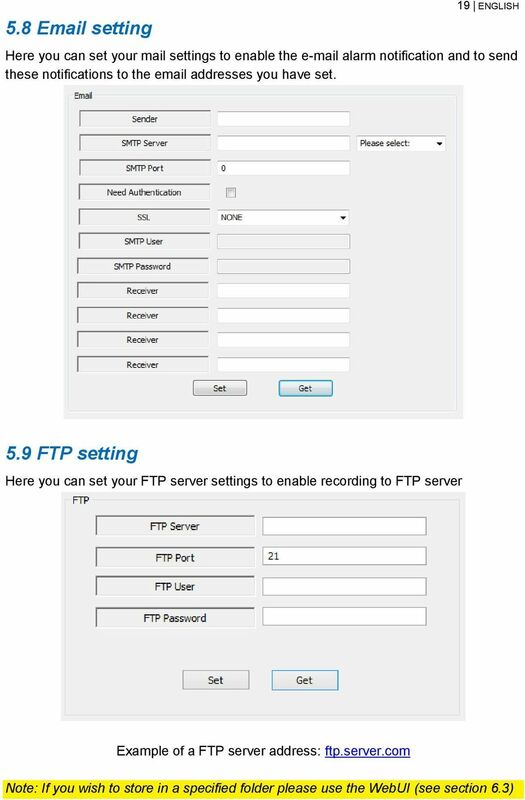 6.3 FTP setting Here you can enter the settings of your FTP server. 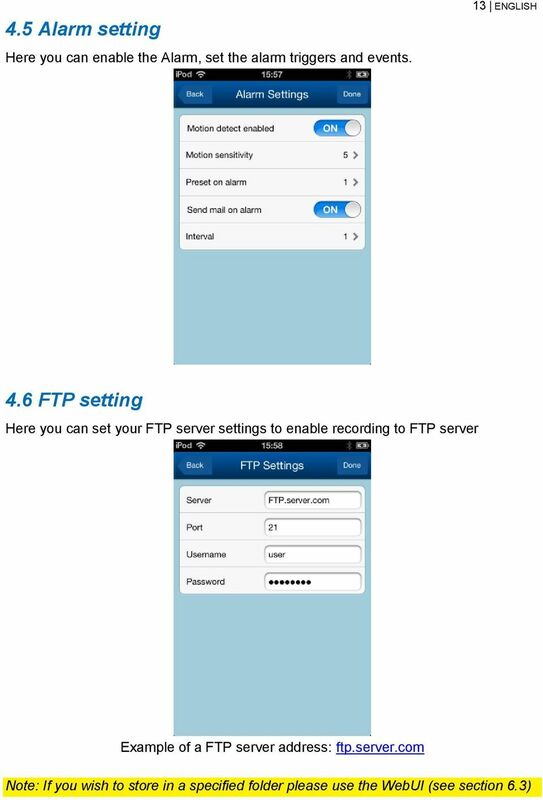 Example of a FTP server address: ftp.server.com Note: If you wish to store the snapshots in a predefined folder on your FTP server, please use this option since the APP does not support this extra feature. 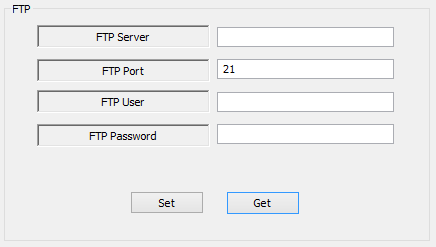 Enter the folder name in the Path field and press OK then press Test to test if the folder is created successfully. 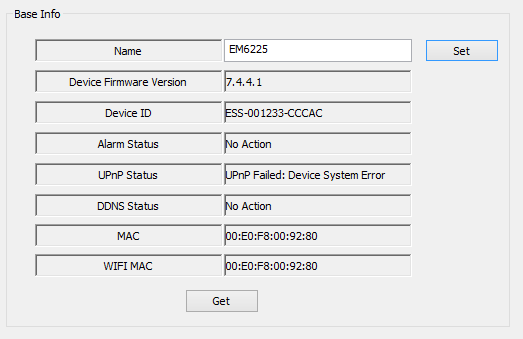 25 8.0 Upgrade Device Firmware 25 ENGLISH If there is a new firmware available for the EM6225, you can upgrade the firmware via the Web UI Maintenance page. A status message about the percentage done in the upgrade procedure is displayed. Please note: do not power off the EM6225 during the upgrade procedure. After the upgrade procedure is finished, the system will restart automatically. For more information about firmware upgrade please see the manual enclosed with the firmware. 9.0 Frequently Asked Questions and other related information The latest Frequently asked questions for your product can be found on the support page of your product. Eminent will update these pages frequently to assure you have the most recent information. Visit for more information about your product Service and support This users manual has been carefully written by Eminent s technical experts. If you have problems installing or using the product, please fill out the support form at the website You can also contact us by phone. Please check for the helpdesk phone number and opening hours. 26 11.0 Warning and points of attention 26 ENGLISH Due to laws, directives and regulations set out by the European parliament, some (wireless) devices could be subject to limitations concerning its use in certain European member states. In certain European member states the use of such devices could be prohibited. Contact your (local) government for more information about this limitations. Always follow up the instructions in the manual*, especially where it concerns devices which need to be assembled. Warning: In most cases this concerns an electronic device. Wrong/improper use may lead to (severe) injuries! Repairing of the device should be done by qualified Eminent staff. The warranty immediately voids when products have undergone self repair and/or by misuse. For extended warranty conditions, please visit our website at *Tip: Eminent manuals are written with great care. However, due to new technological developments it can happen that a printed manual does not longer contain the most recent information. If you are experiencing any problems with the printed manual or you cannot find what you are looking for, please always check our website first for the newest updated manual. Also, you will find frequently asked questions in the FAQ section. It is highly recommended to consult the FAQ section. Very often the answer to your questions will be found here. 1 Introduction... 3 1.1 The package contents... 3 1.2 Function and Features... 3 1.3 Product Specification... 4 2 Appearance and interface... 5 2. 4CH Digital Wireless Security System Model: 8104JR/8105JR/8107JR EU Environmental Protection Waste electrical products should not be disposed of with household waste. Please recycle where facilities exist.